It’s been ten years coming, but an ambitious, $4.2 million reconstruction project at Mattapan’s largest city-owned park is now well underway. Almont Park’s marquee addition, a newly-installed football field, will open this week— just in time for the neighborhood’s Pop Warner program to start practices on August 1. This week, Mayor Martin Walsh added another new element to the build-out at Almont: Heeding calls from residents, Walsh has ordered the project to add a little league baseball field to the next phase of the construction, expected to begin this fall. The baseball diamond will be added to a corner of the park that is now used mainly for cricket— and it will give Mattapan a chance to start-up a youth baseball league next spring. The mayor— who coached little league baseball in his home neighborhood of Savin Hill for years— said he was dismayed to hear that Mattapan did not have a little league program of its own. During a coffee hour at the park, held earlier this summer, Walsh said he toured the park and decided that it could— and would— accommodate a baseball field. Almont Plan: This map of Almont Park shows the wide mix of uses that are included in the current improvement project at the 17.05 acre park in Mattapan. 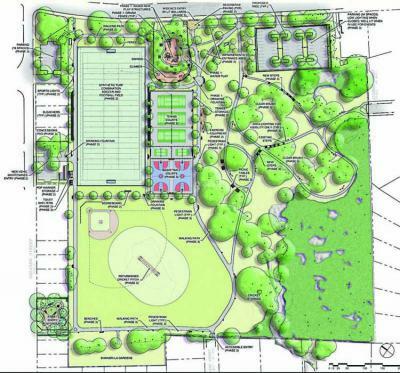 Image courtesy City of BostonWalsh’s decision is the latest good news at Almont— which neighbors and youth sports organizers have been lobbying to improve for the last decade. Under the Menino administration— and with a heft push from then City Councillor Rob Consalvo— the city pledged to spend more than $2 million to build a new playground, install the new football field with lighting, and improve the park’s walking trails. Since then, the Walsh administration has layered in new amenities and spending to make the project even more expansive. Earl Faulk, a longtime advocate for Almont Park, said that the city’s progress in recent weeks has been encouraging. Faulk has been pushing the Walsh administration to include the baseball diamond, which he says was in the original plans for the park, but were later dropped from the final design. Donald Caisey, president of the Mattapan Pop Warner organization, said that the league is delighted to finally host regular season and — potentially— playoff games on a home football field, something the Mattapan teams have never been able to do. Practices were held at Almont through the years, but games had to be played at Curry College or in other city neighborhoods. The artificially surfaced football field is ringed by new “Musco” lights that can be controlled via cell-phone apps — allowing city officials to regulate night games and practices remotely. The field has a new scoreboard and will soon have new off-street parking areas added to help accommodate visitors and families ferrying kids to football events. The league currently has about 150-200 kids per season playing on the football teams, which begin at age 5. The league also runs a successful cheerleading program based at the field. “We want to be good neighbors and currently we don’t have parking. Parents sometimes have to double and even triple park to pick up kids. It will be fantastic to accommodate the neighbors as well,” said Caisey. The prospect of adding a baseball league—and possibly soccer as well, which is another sport notable absent from Mattapan’s parks— has both city officials and residents excited. The mayor agrees: “This is 4.2 million and it’s a big investment, but I’d have to say it’s long overdue. People have been waiting a long time for it and it touches young people and older folks too. There are these great walkways and lights. 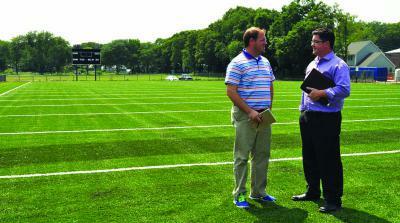 It serves a lot of different demographics and it’s a very good-sized park,” said Walsh. Construction work will likely continue at the park into the next year. The second phase of work at Almont remains in progress. Last week, crew were busy laying a foundation for new tennis courts and a basketball court that will be installed in the center of the park, behind the playground area, which has become a popular destination for day care groups and families. Among the items not yet resolved— but which Caisey and Faulk says remain priorities for the community— are security elements. They want surveillance cameras installed to help monitor any criminal acitivity. And Faulk hopes that a police call-box, that has not worked in years, will be fixed. “You have more visitors coming in and more kids now, so any safety measure you can do, you want it and it should be built in,” said Faulk. Registration for the upcoming Pop Warner football and cheerleading season continues through the month of August. Parents can bring their youngsters to the field to register them on the evening of August 1. Participants must bring a birth certificate, a recent medical check-up report and a school report card, said Caisey. More information on the league is available online at eteamz.com/mattapanpatriots.